Jews and Muslims gather in Berlin to demonstrate against a controversial circumcision court ruling. Jews and Muslims gathered in Berlin on Sunday to demonstrate against a controversial circumcision court ruling, Deutsche Welle reported. According to the report, some of the protesters said they could not live in Germany if the practice is outlawed. “The 'yes' to circumcision must be secured in law,” said Lala Süsskind, who chairs a Berlin-based organization against anti-Semitism. She and around 300 demonstrators gathered at the Bebelplatz square in Berlin to call on the government to pass such a law immediately. The protest was sparked by a Cologne court's ruling in June that the ritual circumcision of a four-year-old Muslim boy represented a criminal assault. 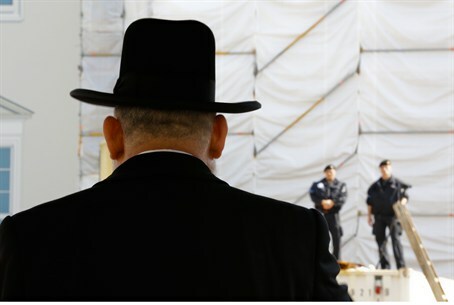 “This ruling was incomprehensible for us,” Berlin Rabbi Gesa Ederberg told Deutsche Welle, adding that the national debate which ensued was equally troubling. Parents continue to circumcise their boys in Berlin, Rabbi Ederberg said, but the Cologne ruling means extra stress for them. Rabbi Yitzhak Ehrenberg showed demonstrators a letter of complaint he received from state prosecutors after he encouraged his congregation to adhere to the millennia-long tradition of circumcision. "I will say it once more: We're going to continue," the rabbi shouted to applause from the demonstrators. Another attendee at the protest was Kenan Kolat, who heads the Turkish Community in Germany. Kolat, a Muslim, said that Muslims and Jews must work together to ensure that circumcision remains legal. He added that more Muslim parents are beginning to take trips to Turkey to have their sons circumcised in the wake of the Cologne court's decision. In late July, Germany's lower house of parliament passed a resolution to protect the religious circumcision of infant boys. Last week, Berlin made new laws for people who want to circumcise their sons, but and traditional Jewish mohels don't meet criteria. The new laws state that the practice must be carried out only by doctors, according to a “medically professional standard,” including a sterile environment, as little pain as possible, and care to stop bleeding. Jewish mohels who traditionally perform the circumcision ceremony lack the necessary medical training, according to Berlin's top justice official, Thomas Heilmann, and therefore are prohibited from carrying out the procedure.